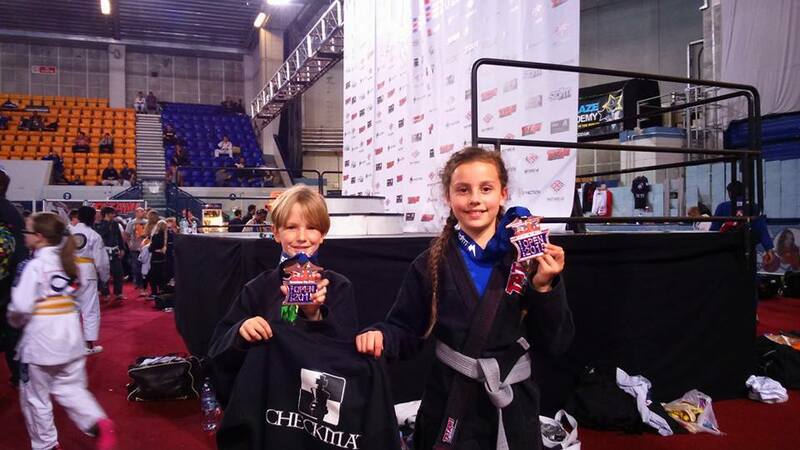 A big well done to all the McKenzie Brazilian Jiu Jitsu boys and girls (based here at the Crawley Martial Arts Academy) for their performances at the weekend. It was a big team out (Graham, Paul, Dan, “Keys”, Jim, George, Wayne, Mike, Przemyslaw and Joanna) that took home three golds and plenty of silvers – several of whom are still relatively new blue belts in a division with plenty of people ready to make the next step up to Purple. The Checkmat guys (our lineage is via the Viera brothers in Brazil so we’re the McKenzie BJJ team, part of Checkmat and based at the Crawley Martial Arts Academy) did fantastic with 18 year old George Kolorov fighting in the Adult Blue Belt, Heavy Weight division – winning his first two fights convincingly before making a tired error in the final to take a silver medal. Super-slim, super-strong Graham Day pulled guard twice to fight from his favourite position on the bottom winning with two triangle chokes, while Paul Brimelow won his first fight with an armlock and his second submitting his opponent AFTER he’d already gone 16 points up. An impressive victory for Paul. Przemyslaw and Joanna both won Silver Medals, while Dan and Steve took home Bronze medals for the team. All in all, it was a fantastic performance from a team that’s just getting stronger and stronger and with the Oxford Open only around the corner – next month should be even better (and hopefully we’ll bring an even bigger team). This years BJJ British Open saw the Checkmat BJJ team place 2nd in the overall team results with our team of Crawley fighters playing their part and bringing home several medals. With competitors in the White, Blue, Purple and Black Belt dvision it was a diverse team from the Crawley Martial Arts Academy on the mats for the days competition including 17 years old George who decided to skip the youth division and go straight for the jugular by entering the adults competition. 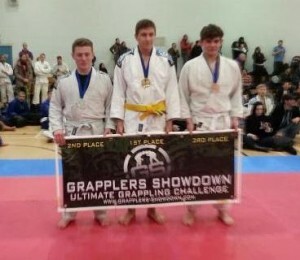 Wrestler and first time competitor Ali Carter tried his hand in the Gi at White Belt level winning his first two fights before losing his third fight. Relatively new to the team – Martin Duke battled it out for two fights, winning them both before losing in the quarter finals. Thaiboxer and BJJ enthusiast Marco Carvalho won his first fight and lost his second contest. 17 year old George Kolarov (in his first Blue Belt competition) won his first two fights before losing his third contest. Heavyweight Lee Wilderspin – who pretends to be the underdog – took home silver. The tough Konrad Gedzik won four fights at Blue Belt, losing to an Ezekiel choke in the final to take home a silver medal. 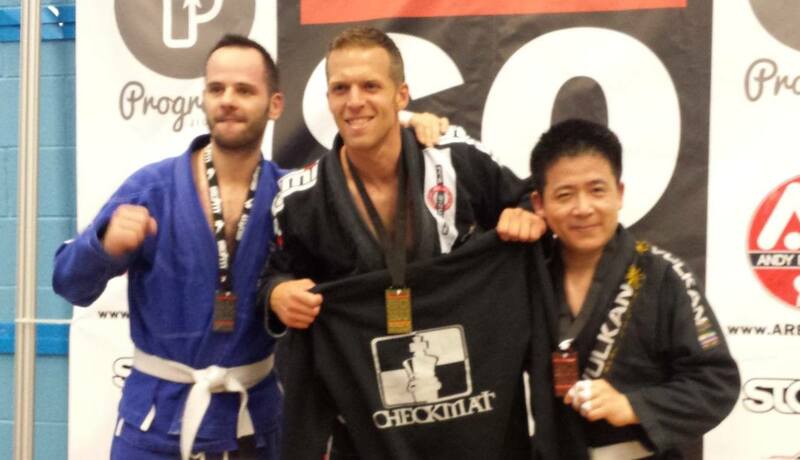 Horsham’s Graham Day – who was determined to do well – did himself proud to win yet another Silver medal for the Checkmat Crawley team. Sam Hewitt – who’s had a good year competing regularly lost in the first round, hugely disappointed at the points lose. Leg lock and Judo expert – Rolanas Cizauskas – won his first two fights convincing before having what can only be described as a ‘war’ in the final only to lose on points in the final. While Black Belt Keith McKenzie won his first fight and narrowly losing the final on an advantage point to win the silver medal. Overall the Crawley BJJ Team took home 2 Bronze and 5 Silver Medals and it was great to see all the guys back on the mat Monday evening – ready to learn from any mistakes at the British Open and improve their game. The Brazilian Jiu Jitsu team will be back on the Mats at the Surrey Open on the 6th July in Guildford. To find out more about learning Brazilian Jiu Jitsu, Muay Thai, Boxing or MMA in Crawley you can get in touch with our gym on 01293 552 511 or enter your name and contact number in the box on the side of this page. 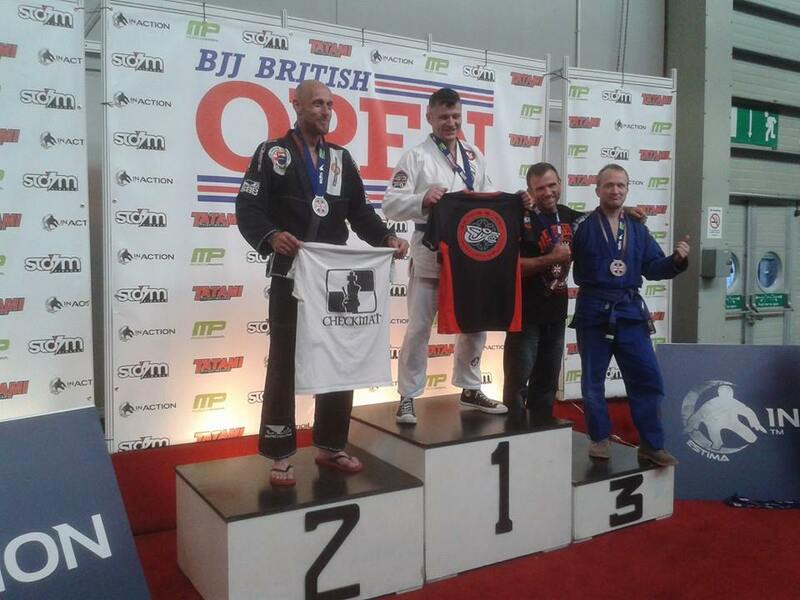 Crawley BJJ’s Sam Hewitt walked away with a Silver medal at this weekends’ TUFF Challenge in Southampton. Fighting twice in the same day Sam won his first fight choking his opponent unconscious with a bow and arrow choke (see the video). His next fight – the purple belt final – the fight ended a draw with both fighters level on points and no advantages. The referee gave the fight to Sam’s opponent, leaving him to walk away with the silver medal. To find out more about learning Brazilian Jiu Jitsu at our gym in Crawley call us on 01293 552 511 or enter your name and telephone number in the box on this page. 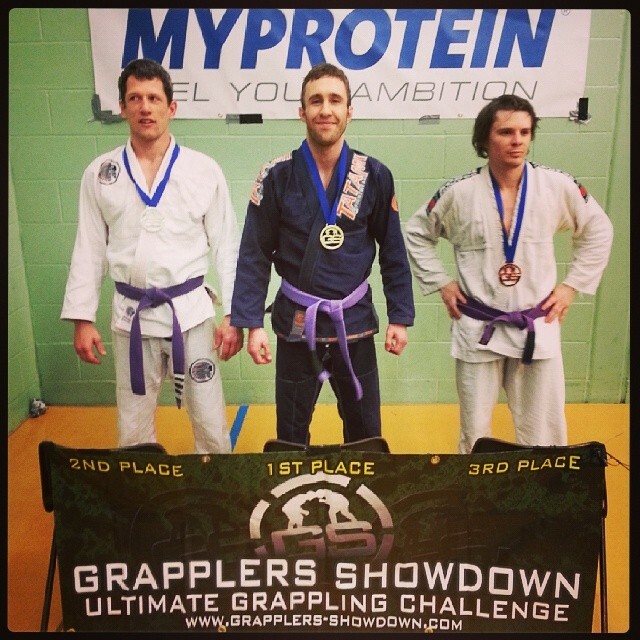 Crawley BJJ – Sam Hewitt took gold at the Grapplers Showdown in Southampton at the weekend. The purple belt who’s trains at the Crawley Martial Arts Academy in Manor Royal had been training up to twice per day in the run up to the competition and entered both the Gi and No-Gi competition. In the No-Gi absolute competition Hewitt won his first fight by submission (via Gogoplata). The Absolute division is open to all weight classes so when faced with a bigger opponent in the next round Sam went on after getting caught in a guillotine-like choke by an experienced wrestler. Sam started here the UK before moving to the States to study. While there he spent time training under Pedro Sauer while in Utah before moving to Florida where he trained at the infamous Top Team America Team – eventually fighting under MMA rules. On his return to England Sam started to hone his Thaiboxing skills fighting as part of the Lumpini Thaiboxing Team here in Crawley and working on his Brazilian Jiu Jitsu under Black Belt Keith McKenzie. An Osteopath at the Body Health Clinic and sports masseuse by trade – Hewitt is looking to get back on the mat this month in preparation for the British Open held in May. One of the UK’s most prestigious tournaments Sam’s setting his expectations high and will be looking for another placement. For anyone interested in learning Brazilian Jiu Jitsu, Wrestling or MMA you can get in touch with the gym on 01293 552 511 or enter your name on the inquiry box on this page. Next week will see our McKenzie BJJ team hit the mats at the Checkmat interclub competition in London. Head coach Keith McKenzie will be bringing a team of grapplers to the annual event at the Checkmat Headquarters and everyone is in training ready to make the Crawley Team proud. If you’re looking for a little bit of BJJ Motivation then have a look at these highlights of the Copa Podio competition. It’s only a short video but a great video of BJJ in action. 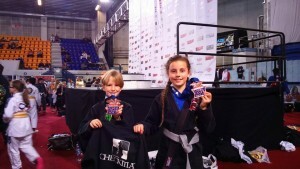 Crawley Martial Arts Academy’s Jiu Jitsu team were out in full force competing in London last weekend. The team of eight grapplers, fighting for the first time this year, were travelling with high-hopes after weeks of intensive training under head-coach Keith McKenzie. For several weeks the team had been training specifically for the competition, working on their technique while working on their strength and conditioning at the Manor Royal based gym. With the preparation done they travelled up quietly confident and brought back 3 Gold and 3 Silver Medals to the clubs growing trophy cabinet where only last week local fighter Ruth Ashdown placed her new WBC International Muay Thai Title. 15 year olds George Kolarov and Josh Stapleton fighting in the same weight division were first on the mat and both winning with chokes. The two later met face to face in the Teenage Final with George winning by submission and Crawley taking home their first Gold and Silver medal of the day. Next up were the lightweights with Konrad and Ollie West taking center stage. The biggest of the weight categories both won their first fights convincingly before losing out in the second round to tough opponents. Johnny Blyth in the 76kg division found well losing out in the later rounds. Entering the Absolute Division he found his second wind winning three fights back to back by submission. Coming up against a tough, heavier opponent in the semi-finals Johnny lost by submission, taking home the Bronze Medal. 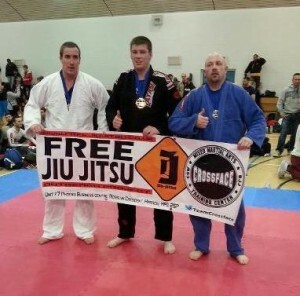 In the same Absolute Division, Crawley’s BJJ Team fighter Vasco Santos winning the Silver medal. In the 88kg competition Alan Sawyer and Chris Singers met each other in the final. Both had won their previous fights by submission. All was tied in the up until the last few seconds before Chris made a last gasp effort to take the Gold on points. Star of the day had to be Lee Wilderspin who in the build up to the fight had been master a new fight strategy. The biggest fighter on the team Lee executed his fight plan to perfection. Taking his opponents down and controlling them on the ground before submitting both his opponents with arm locks. With the team on the up and up, and the level increasing the Crawley Martial Arts Academy has growing team of experience White Belts, Blue Belts and Purple Belts. Led by Black Belt and 2x European Champion, Keith McKenzie, there has never been a better time to get started. If you’d like to find out more about learning with Crawley’s BJJ Team — for fun, for fitness or for self-defence and competition — give us a call on 01293 552 511 or enter your name and email address on the box on this page. Recently we’ve also added Brazilian Jiu Jitsu (BJJ) to our weekly kids martial arts classes starting from age 11+.